"A Keyblade radiant with light." "A Keyblade black as darkness." When at his full strength in Kingdom Hearts II, Kingdom Hearts 358/2 Days, and Kingdom Hearts III. Roxas is able to use his Synch Blade ability to wield Oathkeeper and Oblivion, two Keyblades symbolic of Sora's memories of Kairi and Riku, respectively. [please confirm] Roxas is able to wield two Keyblades because he is the Nobody of Sora, who possesses his own heart as well as Ventus's. Roxas is not able to use his Synch Blade at first because of Xion's existence, but her destruction awakens the ability, which he activates as he begins his assault on The World That Never Was. However, he is confronted by Riku, who defeats him and drags his unconscious body back to Twilight Town, where he is given false memories in order to keep him complacent within the simulated Twilight Town. However, by the sixth day there, Roxas has regained his memories, and when Axel attacks him for leaving the Organization, Roxas summons the two Keyblades and defeats Axel. Later, when Sora enters The World that Never Was, he is accosted by Roxas, who is once again dual-wielding Oathkeeper and Oblivion, and the two Keyblade wielders battle inside Sora's Dive to the Heart. During the fight, Sora is able to take Roxas's Keyblades and use them against their owner, delivering the fatal blow. Roxas utilizing both Oathkeeper and Oblivion for the first time in the World That Never Was before the battle with Riku in Kingdom Hearts 358/2 Days. In the Story Mode of Kingdom Hearts 358/2 Days, Roxas can only dual-wield the Oathkeeper and Oblivion during the first half of Mission 93. However, in Mission Mode he can wield the two Keyblades by equipping the Zero Gear with three Ability Units. Roxas's ground combo begins with two slashes, left to right, then a spinning move, all done with a simple press of the button. From there, a -Combo is prompted, which will lead the combo into another two slashes, left to right. Another push of the button will result in another slash with the Keyblades, then an upward slashing movement with some spin. With one final push of the , Roxas's Keyblades will spin around him and fly into his hands, causing damage to enemies. When a normal combo is continued, it will lead into another set of two slashes, followed by another slash with some spin. Roxas will slide forward, a Keyblade extended, and slash with his other hand as a follower, and it will conclude with Roxas poising his Keyblades behind to him, then unleashing a devastating X-like slash with both weapons. The aerial combo begins with two quick slashes to the left and right, followed immediately by a mid-air slash with some spin, two moves that could easily be mistaken as one. Another -Combo is prompted, which will result in an early usage of the aerial combo's finisher. The normal combo continues with another set of two slashes, one going up and another going left, which is followed by a sideways slash along with a powerful uppercut. The combo finishes with Roxas's Keyblades flying around him dangerously, then him catching them with powerful posture. 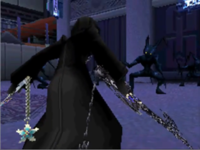 In Kingdom Hearts II, Roxas is only able to dual-wield Oathkeeper and Oblivion during his fight against Axel. In this state, Roxas can do a five-step combo both on the ground and in the air, with his ground finisher a spinning slash that can knock enemies airborne and his aerial finisher being similar to Sora's Hurricane Blast finisher. In Kingdom Hearts II Final Mix, during the boss fight against Roxas, Sora is able to telekinetically use Oathkeeper and Oblivion in conjunction with his own Keyblade by performing the Duel Stance Reaction Command and pressing The End. During Sora's combos, Oathkeeper and Oblivion react according to Sora's attacks, spinning around Sora during normal attacks and piercing Roxas during finishers. In Kingdom Hearts III, Roxas becomes an ally of Sora against Saïx, still being able to dual-wield Oathkeeper and Oblivion. Oathkeeper and Oblivion as they appear in Kingdom Hearts II. ↑ Famitsu Interview; Nomura: "The Keyblades the boy who knows Sora is holding are the Oathkeeper and Oblivion from the first game. The precious "Oathkeeper", which Sora received from Kairi. 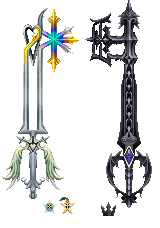 The jet-black Keyblade, symbolic of Riku. / The Oblivion, at first, was called Riku's Keyblade. The boy who has the Keyblades from Riku (darkness) and Kairi (light)......Who is he!?" This page was last edited on 21 April 2019, at 13:17.